The world’s second-largest beer maker launched “Heineken 0.0” at the Spanish Grand Prix in Barcelona and will sell it in 14 markets, across Europe and also Russia and Israel, unlike rivals which have non-alcoholic beers for individual markets. Heineken is hoping to tap into what it believes is an increasing desire among consumers for beer that will not get them drunk. The European market for zero alcohol beer grew about 5% a year from 2010 to 2015, according to research group Canadean, while the overall beer market shrank. Rival AB InBev, which makes more than a quarter of the world’s beer, is aiming to make a fifth of its beer low or zero alcohol by 2025. For the maker of Budweiser, Stella Artois and Corona, low means an alcohol content of up to 3.5%. Zero alcohol beers could offer brewers higher margins because of lower taxes and could see them muscling in on the soft drinks market with what they say is a more natural and healthier option. 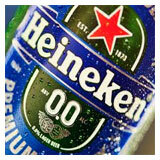 Heineken 0.0, for example, has half the calories of standard Heineken or Coca-Cola. “You could expect 10 to 15 years down the road this would be more or less the global trend. We want to make Heineken the leading global beer brand in 0.0,” senior Heineken brand director Gianluca Di Tondo told Reuters. Beer critics say a key reason why zero alcohol beer has failed on previous occasions is taste. Heineken brewmaster, Willem van Waesberghe, said many previous and existing non-alcoholic beers were too sweet and malty, either because the fermentation process was cut short or because flavours were lost as alcohol was boiled off. Van Waesberghe recognises that a beer without alcohol will not taste the same, but believes the company has found a brew that recreates some of the fruity, bitter and acidic tastes found in a normal 5% Heineken. The company makes two separate brews with different qualities, then removes the alcohol and blends them together. “Both beers are not nice. You need to blend them together to make a good beer,” he said.